Today I and my kids take another step on our grief journey. This afternoon we will be burying Russell’s ashes at the Immaculate Conception Cemetery in Columbia, IL. We’ve explored many ideas of what to do with Russell’s ashes and finally settled on burying them at this cemetery. Russell was deeply connected to the community at Immaculate Conception and in many, many ways they were helping him find his way back to a sense of mission and calling that had been hidden from him for many years. It is a community that continues to embrace and support us and it seemed like a fitting place to place Russell’s ashes. There are many places we had talked about scattering his ashes but I admit we all felt a little daunted at the thought of traveling with him in our vehicle to these places. While we might have someday felt more ready to travel to some of his favorite places and scatter ashes along the way, we also know that this is a part of the journey that we don’t want to drag on for months or years. Heck, we still have cremains from several dogs we need to bury at our home at some point and these dogs died years ago. The thought of having Russell’s ashes remain in limbo somewhere for possibly years was just not something we wanted to do. 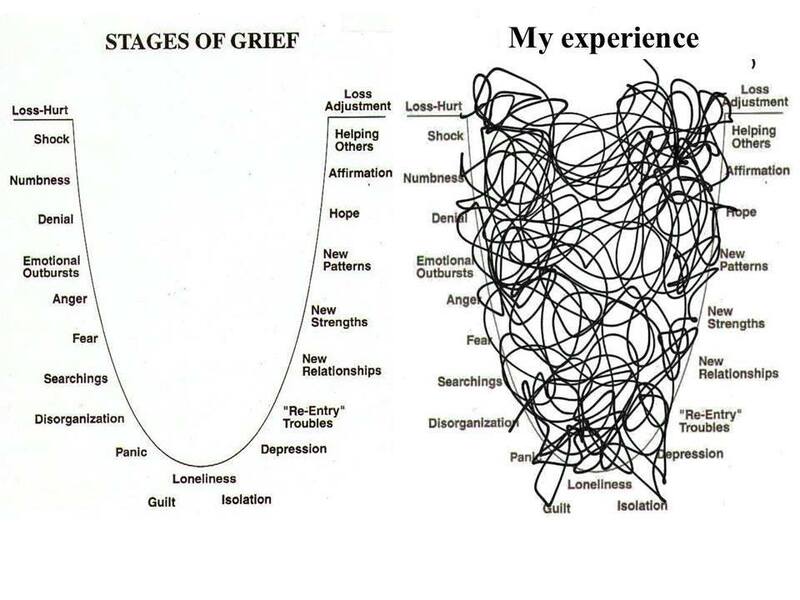 As we prepare ourselves for this afternoon and the new or renewed emotions it may stir up, I have been reflecting deeply about the grieving journey for myself, my kids and those who are supporting us. This morning I keep coming back to my belief that the grieving of Russell’s friends and extended family is just as real, raw, and ongoing as it is for me. And in some ways I think the shock of it all hits other folks sharper on days like today. I (and I hear this from my kids too) have an underlying, constant thread of loss and missing Russell that winds through all that we do. Living in the house that we lived in with him for so long is a constant daily reminder that he is gone. Much of what we do each day can lead us back to thinking of him as we want to tell him things or show him things or expect him to walk in the door at 10:30 at night when he usually came home from work. Most of the time now these are just a thread of reminder, not a sharp jab to our hearts. Some days are much easier than others, especially when we get busy with just living our lives. Days like today, or his birthday, or holidays, or other anniversary dates are more challenging as we can’t help but think of him and deeply remember he is no longer here with us. For those who didn’t live in this house – his friends, all of his family, his parish community, folks in the Avalon community and other communities he belonged to – the grieving journey is just as real, albeit perhaps not as constantly raw. The degree with which it is felt on a daily basis varies from person to person. I know many are experiencing it as deeply and consistently as I am. I do think, in some ways, days like today in which we will say another goodbye to Russell are extremely sharp reminders to these people who loved Russell that he isn’t here. Most of these folks expect to see Russell with the kids and I when they see us. To not see him, and have that strong reminder that they won’t again has got to be like a slap in the face or a punch in the stomach. I would imagine it is like being dropped back into a pit of confusion and sadness and questions of “how the hell could this be?”. It might stir up powerful emotions that lie dormant most of the time. Mind you these are only observations and come out of a great deal of pondering I do around the universal experience of grieving and loss we all experience. It comes from some of my own experiences of being one of the support people for someone grieving the loss of one of their closest loved ones. I have many memories of moving through my life in a somewhat normal fashion after the death of someone who I loved but maybe didn’t see a whole lot. And then being slapped upside the head by sadness from seemingly out of nowhere. It would leave me feeling stunned and exhausted and barely able to function for days. I in no way want to tell someone else what they are experiencing, I am simply trying to give voice to my recognition that there are many, many more folks than just the kids and I who I know are deeply grieving our loss of Russell. I recognize that we are all traveling a jumbled up, winding path like pictured here. There is no straight clear line from point A to point B. There is no clear definition of what it looks like to support one another as we learn to move forward in a world without Russell’s physical. There is, sometimes, no way to answer the question “what can I do for you?”. When things are so twisty and jumbled up, I think all we can do put one foot in front of the other and hold onto each other’s hands along the path. Each of us must stay true to our OWN journey whatever it looks like. Some of us want to talk about it as much as possible. Some of us can’t talk about it at all just yet. Some of us need to do something. Some of us need to do other things so we don’t feel consumed by the grieving. Some of us want to embrace and celebrate Russell any chance we get. Some of us want to hide under the covers and never come out. And I think many of us could yes to all of these things at some point on our journey. My main hopes for all of us is that we can stay true to our own individual journey, respect the journey of others walking with us at this time, support each other in whatever way we feel comfortable, and hopefully come together in celebration of the love we still feel for one another. In our joys, in our brokenness, in our laughter, in our tears, in our silence, in our speaking, in all of it I hope we can feel the love that wraps around us all and learn to take people as they come before us each day. As ever, in this time, in this moment I am filled with gratitude for the journey I am on and my companions along the way. I could not walk this path alone and am deeply grateful that I don’t have to. You and the kids and Kirsten and her kids will always be part of ICC. We all loved Russ and miss him greatly. Hugs to all.